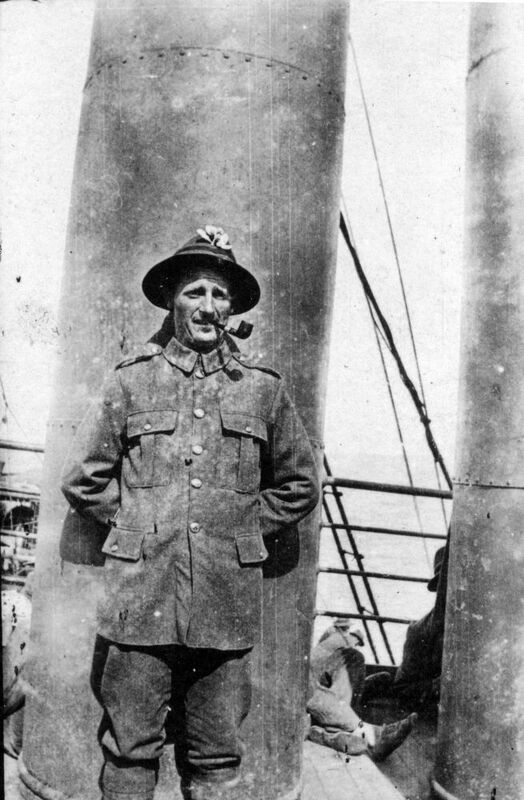 Albert Summers on a troopship, probably returning to New Zealand in 1919. Albert Summers was born in 1892 to William and Louisa Summers, at Rangitumau, north of Masterton, one of 16 children. Soon after the family moved to ‘Brancepth’ where William was the gardener. About 1895 the family came to Masterton and Albert attended Te Ore Ore Native School. Later the family went to Lower Hutt where Albert did an apprenticeship in bootmaking. He enlisted in July 1916, becoming part of the 19th Reinforcement, service number 31372. After training at Trentham and Featherston Camps, he sailed to war on the Tahiti in November 1916. There was more training at Sling Camp in England and Etaples, France, before he was posted to 1st Wellington Battalion on 3 June 1917, just before the Battle of Messines. After the Passchendaele campaign he spent some weeks with the Australian Tunnelling Company in early 1918. Unusually he was promoted corporal bootmaker, utilising his trade to keep the battalion well-shod. He went through the Second Battle of the Somme and was promoted sergeant in August 1918. Four of his brothers also served overseas. It was March 1919 before he was sent home, via the Panama Canal. The Summers family had settled in Msterton and Albert resumed his trade of bootmaking. He married Alice Youngson in 1920 and the couple had two children. Albert and Alice were successful ballotees to buy one of the cottages built on land in Upper Renall St donated by Arthur Whatman. Like many of his contemporaries, Albert was a Home Guardman in World War Two. He lived the rest of his life in Masterton, dying in 1966 and buried in Masterton Cemetery.